Art Resources & Stuff has more resources than any art site on the internet! We have everything but the kitchen sink in here. Mona is very happy to share her art stuff with you! 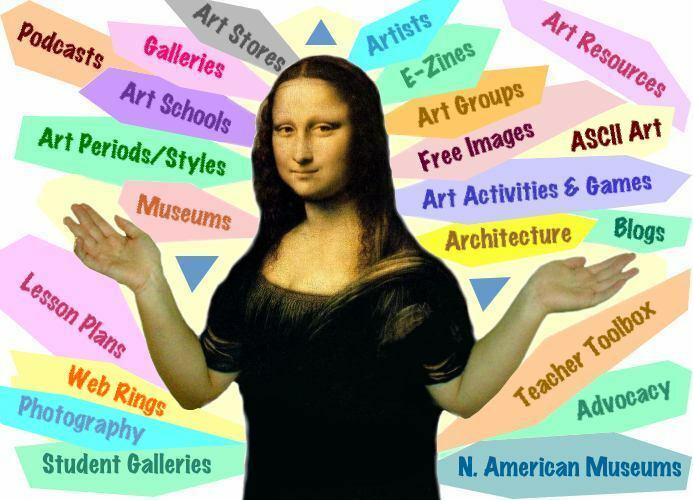 Watch podcasts, study artists, visit art schools, see architecture, visit museums and galleries, read art blogs, get free stuff, participate in art related groups, and get lessons and activities. The Artist Encyclopedia section is categorized by African American artists, female artists, male artists, ethnic artists, native artists, and cartoonists. There are pages that have collections of artists there too. Also in the artist section is the most comprehensive biography of John Lloyd Wright, the inventor of Lincoln Logs, architect, and son of one of the greatest architects, Frank Lloyd Wright. John's relatives have contributed to this section. Art Resources & Stuff even includes an ASCII art section. ASCII art is created with a combination of letters and numbers. Although ASCII art has lost some of its popularity, you sometimes see it in Facebook posts and in e-mail signatures. Art Resources & Stuff also has several games you can play. You can paint with the Pointillator or the Impressionator as well as visit many links to great art games and activities.